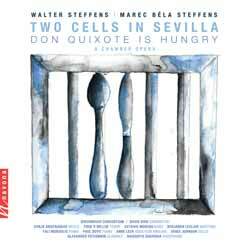 Two Cells in Sevilla is an opera by German composer Walter Steffens. The libretto, written by Steffens's son Marec Béla Steffens, merges the lives of Brother Gabriel Téllez, best known under his pen name Tirso de Molina as the inventor of the fictional womanizer Don Juan, and that of Miguel de Cervantes, the author of windmill-fighting Don Quixote. Both look upon the world from their own respective confines – the monk Brother Gabriel from his cloister, Don Miguel from a debtor's prison cell. Their divine literary outbursts are provoked by a very mundane desire: Both habitats share the same slothful cook, a lady with a penchant for gallant novels. Spurred by the same simple wish of enjoying a heartier fare, both Brother Gabriel and Don Miguel de Cervantes embark on a competition to come up with the raciest, most exciting novel to win the good will of their cook. The music captures this dialectic. This album is rounded off by Steffens's musical interpretation of five poems by Friedrich Hölderlin, widely known for the intensely lyrical, idealistic quality of his work and his tragic descent into insanity. It goes without saying, but I'll say it anyway: You're unlikely to find much here to enjoy if you are turned off by opera. But those that love the genre will find this to be a diverse and well produced album. There are 11 tracks (50 min, 27 sec) with the album split in half. The first 6 tracks (38 min, 06 sec) make up 'Two Cells in Sevilla'; with the remaining 5 tracks (12 min, 21 sec) being from 'Five Songs on Holderlin, Op. 95'.